I wanted to thank you all, again, for your support during the February release of Old Money, New Woman: How To Manage Your Money and Your Life. The book is off to a strong start with great reviews. The promotional campaign is in full swing. I’ve recently returned from the U.S. where I made a few appearances at private book signings in Los Angeles and Austin. Numerous independent bookstores, librarians, bloggers, and influencers on social media are reviewing copies at present. We’re expecting quite a few orders in the coming weeks. Fupping.com has included both The Old Money Book and Old Money, New Woman on two separate ‘Must Read’ Lists. I’m truly grateful. The big news to share with your family and friends is this: if they want their own hardcopy or paperback of Old Money, New Woman, and don’t want to order through Amazon, they can visit their local Barnes & Noble brick-and-mortar bookstore and buy it. If it’s not on the shelf, just ask a sales associate to order a copy. They can have it shipped to the store promptly, or delivered directly to your door. The goal is simple: to make Old Money, New Woman required reading for every young woman in America, ideally during her senior year of high school. 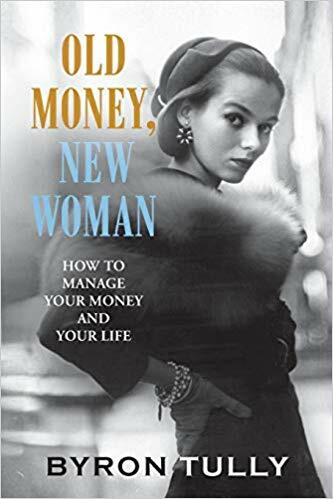 A final note: if you know high school counselors who might enjoy receiving a copy of Old Money, New Woman, please feel free to contact me directly, or forward a link to this post. I’ll be happy to provide a complimentary copy to them. So happy to see your book is doing well! Have a great week Byron. This is fantastic news. I love being able to buy the book and have it in my hands. I was having a chat with a co-worker just last night about your books and blog. (Wink nod) I look forward to picking it up in person at my local B&N. I just finished my copy of the book, and I have to say, it is profoundly well done. I, of course, wish you all the success, but moreover, I sincerely wish every woman would take a moment to read this. We must be the captains of our ships or risk running aground. Tonight, I helped my six-year-old divide her “money’s” into her four compartment piggy bank. Save, spend, donate, and invest. We talked about what they each mean and how to divy up her earnings (she does jobs). It was the first time we did this exercise, but my heart was bursting with pride as she was grasping the concepts. Thank you for lending your experience. I have already recommended your book to some friends, and will share it further at every reasonable opportunity. Thank you, Bethany. I really appreciate your kind words, and I’m honored that you’d recommend it to your friends and family. If you haven’t already, please feel free to write a review on Amazon. It’s a small thing, but the reviews are influential as other readers consider purchasing the book. Congratulations! I will march down to B&N and snag a copy.